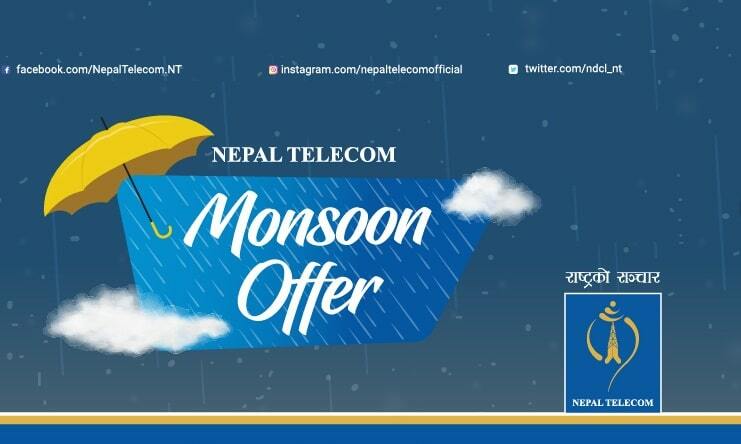 As the monsoon season is coming, Ntc has brought new offer called Monsoon offer to their customers from Shrawan 1, 2075. Ntc has updated some of their offers after the Telecom service charge (TSC) while kept the same in others. Ntc new offer includes most of the same old offers with up to 50 percent bonus data volume. The unlimited one hour pack with unlimited voice, data and SMS resumes with this offer. Similarly, they add the unlimited night voice calls in GSM and CDMA numbers. The details of the offer and the subscription process is included below. Other packs in the NTC monsoon offer are Weekend pack, All time pack, Night data pack, social media pack, streaming pack, WOW time pack, 4G pack, SMS pack, GSM 3G/4G 1 GB per day pack. The offers are valid from Shrawan 1, 2075 for 90 days. Here are the details of the Monsoon offer and the process to subscribe the offers. All of the tariffs include the applicable government taxes. to dial *1415# and select the respective offers in it. Both GSM and CDMA customers can subscribe the offers/packs by sending the respective subscription code to 1415. The subscription codes for each of the packs in the offer are mentioned below. This ALL-TIME pack is valid for all GSM & CDMA (Postpaid/ Prepaid)customers. The user can subscribe this pack at any day of the week but this is effective only on FRIDAY, SATURDAY & SUNDAY(Weekend). The unlimited one hour pack in Nepal Telecom resumes which provides unlimited data, voice, and SMS for an hour. ALL-TIME pack is valid for GSM & CDMA (Postpaid/ Prepaid) customers. Users will get 50% more data in this offer. Compared to the Summer offer, the all-time pack is revised with the same price but having little less data volume. Take an example of Rs 10 pack, where before the main data was 20 MB whereas now it is 15 MB. But the 50 percent data bonus remains the same. This Night-TIME DataPack is valid for GSM/CDMA (Postpaid/Prepaid)customers. Users will get 50% more datain this offer. This pack can be used from 10:00 PM to 6:00AM. This UNLIMITED NIGHT DATA pack is valid for GSM/CDMA (Postpaid/Prepaid)customers. The pack can be used from 10 PM- 6 AM. Users can enjoy full speed up to 1 GB per night and after 1 GB throttled at 256 kbps unlimited. The social media pack is applicable for All Time Use and is valid for GSM/CDMA (Postpaid/Prepaid)customers. This pack can be used on Facebook, Instagram, WhatsApp and Twitter application. Ntc recommends using the official Facebook/Instagram/WhatsApp and Twitter Android/IOS application while using this data pack. This pack is applicable for All Time use and is valid for GSM/CDMA(Prepaid and Postpaid) customers. With this data pack, Nepal Telecom customers can view YouTube Videos and Live TV Streaming from the WOWTIME APP. Currently, this offer can be enjoyed in WOWTIME Application which is readily available in Android/iOS. In the future, more and more application will be added. With this pack, once the user subscribes to any one of the following packages, users will automatically get the subscription and data volume which can be used to view LIVE TV using WOWTIME application. This offer is valid from 1st Shrawan2075 for next 90 days. This package is applicable for 4G/LTE users currently in Kathmandu valley and Pokhara only. Users can enjoy the speed of 4G/LTE network at the lowest cost ever. To enjoy this offer, Nepal Telecom recommends remaining on the 4G Network. Users need to ensure that their handset supports 4G/LTE Network and are under 4G service coverage area. Previously in summer offer, 100 percent data bonus was available whereas now only 50 percent data bonus is available. This pack is applicable for All Time Use and is valid for GSM(Prepaid and Postpaid) customers only. Using this pack, users can enjoy 1GB data per day and will get 20 minutes of streaming data as a bonus. YouTube Videos and Live TV from the WOWTIME APP can be watched using bonus streaming data. This Unlimited Night Voice Pack is applicable for all GSM/CDMA (Prepaid and Postpaid) customers. This Pack can be used between 10:00 PM to 6:00 AM. The one-night unlimited voice pack costs Rs 12. Customers can subscribe to this voice pack by sending a message NVUNL to 1415. This Night Voice Pack is applicable for all GSM/CDMA (Prepaid and Postpaid) customers. This Pack can be used between 10:00 PM to 6:00 AM. Here are the several night voice packs. Ntc also revises their unlimited ADSL price per month which is changed from Rs 700 to Rs 800.